99 00 01 02 SUZUKI SV650 FUEL PUMP PETCOCK * BRAND NEW* with filter ! New petcock for Suzuki SV650. SUZUKI VITARA 2.0 TD HDI. IN LINE FUEL PUMP. REMOVED FROM A 2002 REG CAR. Our panels and painted parts etc are USED parts and will show signs of use, although we do try our best to show any marks or defects which exist using images. Switch Parts & Accessory. Heat Shrink. We work directly with the manufacturer. Add to FAVS. 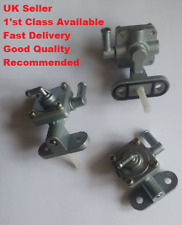 we provide great quality part and service. Brake Caliper. Made by a certified professional supplier. Warranty: 1Year. Product range: Fuel system/Akshay/injection Pump. Year: 2009. Power: Diesel. PHONE 0429 88 88 32. For more information and prices. Suzuki SUPER CARRY. Type: Electronic Fuel Pump. Easy & Secure. However, we will try our best to minimize it. Part Number: UC-V4. Other Part Number: 15100-85501, DWL0910. 100% Money Back. (Suzuki Grand Vitara MK II [2005-2017] SUV. Suzuki Grand Vitara I MK I [1998-2006] SUV. 1 x Electric Diesel Fuel Pump. And we are always ready to go an extra mile to achieve our goal). Part does not fit! For Toyota / Suzuki / Honda / Jeep / KIA / Hyundai / Mitsubishi. 1 x Electric Pump. 1 x Nylon Fuel Strainer. - Impeller design for quiet operation. 1 x Rubber Gasket. 1 x Rubber Hose. 1 x 2pin connector with wires. Common symptoms of a faulty fuel pump are Virtually every manufacturer and vehicle will have a different fuel pump part number. The Gallery picture should look like the fuel pump as fitted to your car. Numéro de pièce fabricant Non applicable. © BÉRARD SA auto parts. Our products. SUZUKI VITARA (1999 - 2003). SUZUKI ESTEEM (1998 - 2001). SUZUKI SWIFT (1998 - 2001). If you do not receive our reply within 48 hours, pls. Manufacturer Part Number Interchange Part Number: J5T23182 J5T23171 91173944. 02/05 - 12/07 SUZUKI SWIFT RS415 (EZ) I 1.5L M15A DOHC 16v MPFI 4cyl Auto 5D Hatchback FWD. 02/05 - 12/07 SUZUKI SWIFT RS415 (EZ) I 1.5L M15A DOHC 16v MPFI 4cyl Man 5D Hatchback FWD. 02/11 ON SUZUKI SWIFT FZ 1.4L K14B DOHC 16v MPFI 4cyl Man 5D Hatchback FWD TO 03/13. 4cyl Man 2D Hard Top 4WD. 4cyl Man 2D Soft Top 4WD. 4cyl Man Tray Back 4WD. 4cyl Man Cab Chassis 4WD. 4cyl Man Pick-Up 4WD. 07/85 - 01/90 SUZUKI SUPER CARRY 1.0L SOHC Carb. 4cyl Man Van RWD. 07/85 - 01/89 SUZUKI SUPER CARRY 1.0L SOHC Carb. Switch Parts & Accessory. Heat Shrink. We work directly with the manufacturer. we provide great quality part and service. Add to FAVS. Brake Caliper. Made by a certified professional supplier. Warranty: 1Year. 08/91 - 04/98 SUZUKI VITARA SZ416 1.6L G16B SOHC 16v MPFI 4cyl Man 4D Wagon 4WD. 07/94 - 05/97 SUZUKI VITARA SZ416 1.6L G16B SOHC 16v MPFI 4cyl Man Softtop 4WD. 01/95 - 12/97 SUZUKI VITARA SE416 1.6L G16B SOHC 16v MPFI 4cyl Auto 2D Hardtop 4WD. Pump injection SUZUKI GRAND VITARA JB 1.9 DDiS JLX, year: 2008. MPN 8200561664. Nous pouvons le verifier. Butcher Krafstoffpumpe pump before promoting fuel pump OPEL/SUZUKI 2250104. SUZUKI 15100-83E00. EAN 4250032683856. Opel 9204647. Opel 4700684. Opel 09204647. Opel 04700684. OE number: 06R11383. Do you need the item as a spare part?. -Compare part number! Small variations in the part number, such as for example different index letter at the end will greatly affect the interoperability with your vehicle. Ddis jlx-es 5-türig 2011 5WK97021. SUZUKI GRAND VITARA JB 1,9 Ltr. DDIS jlx-en 5-türig, Year: 2011 8200 686 558 H8200702517. Spanish, Galician, English, French, Italian, German, Portuguese. MPN 5WK97021. Grand Vitara II 2. Vehicle identification number. 12 month warranty. Within a series, there are too many changes, not all of we can consider. For a flawless appearance, it is necessary to paint the bumpers, fenders, tailgates, doors and bonnets. Direct Stock Replacement 1/4" Inlet & Outlet tube diameter Exact same performance to OE Material: Metal Techinal Data: Input Voltage:12V Operate Pressure:2-4PSI Flow Rate: 50-60LPH Current:1. BÉRARD SA auto parts. Our products. Vehicle Opel Suzuki. The vehicle match list is only intended to assist in your search. Part Number 55185549-hochdruckpumpe-60. Auf'm Rottland 5. Opening hours Auf'm Rottland 5, 57577 Hamm/Sieg. Mileage in miles. Fuel pump 07S110063A Suzuki Wagon R (EM) 97-00. Suzuki Wagon R (EM) ' 97-'00. Buy a used fuel pump here. with fuel sender. Compare the part number (if any), looks and connections. Donor vehicle Part Number / Manufacturer / color / design. Key (2) No. Vehicle colour / code / paint. Within a series, there are too many changes, not all of we can consider. For a flawless appearance, it is necessary to paint the bumpers, fenders, tailgates, doors and bonnets. Fitting in the fuel tank. Sie können das gebrauchte Öl bzw. Weitere Produkte. Wir sind für Sie erreichbar TecDoc inside. Schadstoffhaltige Batterien sind mit chemischen Symbolen besonders gekennzeichnet. Part number: 15100M79GA1. Suzuki ALTO IV. Year of manufacture 06/2002 to 12/2008. Injection pump SUZUKI SANTANA 300, Year: 2006. Nous pouvons le verifier. England: if you need to know if this part is valid for your car, you can send us your car's vehicle identification number (VIN). Fitting Fuel line. Sie können das gebrauchte Öl bzw. Weitere Produkte. Wir sind für Sie erreichbar TecDoc inside. Schadstoffhaltige Batterien sind mit chemischen Symbolen besonders gekennzeichnet. Pump injection SUZUKI GRAND VITARA JB 1.9 DDiS JLX, year: 2006. MPN 8200342594. Nous pouvons le verifier. England: if you need to know if this part is valid for your car, you can send us your car's vehicle identification number (VIN). Butcher Krafstoffpumpe pump before promoting fuel pump RENAULT/SUZUKI 2250065. RENAULT 8200369432. RENAULT 8200639432. SUZUKI 15100-68DB1. EAN 4250032516185. VEMO V46-09-0001. MAPCO 22109. MPN 8200280065C. Nous pouvons le verifier. Fuel pump SUZUKI GRAND VITARA JB 1.9 DDiS JX-A, Year: 2008. Reference: 1510067831000. Nous pouvons le verifier. Spain: If you need to know if this piece is valid for your vehicle, you can send US the VIN number of your vehicle. Mass airflow sensor SUZUKI SWIFT sedan GL, year: 2006. Reference: MB1974003090. Remarks: 84E0 1 5-pin connector. Scrapyards GP. All our products have been reviewed, tested and warranted. Nous pouvons le verifier. If you can not find the version you need we will endeavor to get it. Nous pouvons le verifier.